By the time I arrive at the end of August, I’m tired of the cold, drab world. I’ve had enough of thick socks and boots. I want to fling all the windows open and sit at my desk without a heater, scarf, beanie, blanket and leaden fingers. I want a world that is dust free and washed clean. I long for the rain (Highveld dwellers are parched by the end of winter) and I yearn for fresh new greens and bright colours. Then, just when I feel I cannot get up in the dark once more, daffodils open like little yellow suns all over my garden. Suddenly it’s spring and I’m alive. Suddenly I want to trim and plant, visit the nursery, clean out the birdbaths, redo the flowerbed at the gate (as planned during the Long Cold), and replant my herb garden. Altogether I’m a nicer person, and all because of Daffodils! 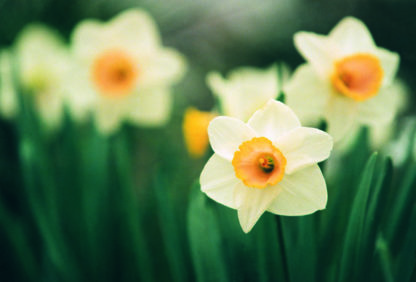 In Wales, daffodils can be found growing wild in eastern parts of the country. They are the national flower, worn on 1 March which is St David’s Day (feast of the Patron Saint of Wales). The Welsh also wear the leek which was adopted as an emblem in battle to distinguish Welsh soldiers from their Saxon foes. The two plants have similar Celtic names, Cenhinen (leek) and Cenhinen Pedr (daffodil or ‘Peter’s leek’). I know which I’d rather wear! When I hear myself groaning about our winters, I cannot help but imagine how gorgeous spring daffodils must be after long, cold, wet northern winters. Somehow, if you say ‘bulb’ the first thing that springs to my mind is always a daffodil (Narcissus if you want to sound posh). Even the bulbs themselves are lovely: they’re just like fat onions with their plump concentric fleshy scales encased in a crisp nut-brown cover. You can plant them right up to 21 June as they actually like cooler soil. Just give each one a gentle squeeze to make sure it’s firm and healthy before putting it into the ground. 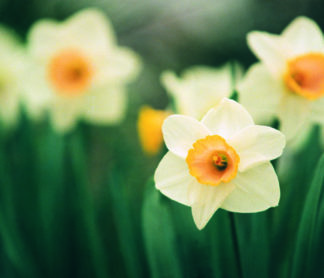 Plant your daffs using the general rule of thumb for all bulbs: plant at roughly twice the depth of the bulb itself. As daffodil bulbs are about 5 cm tall, they will sit in a hole about 10 deep, with 5 cm of soil above each one. By the way, be patient, daffodils do take a while to show themselves. Keep them moist at root level and mulch to keep the soil cool and damp. Don’t forget compost and feeding if you fancy flowering for several successive seasons. 1. Go big: a handful of daffodils will be lost in a garden so go for quantity; be bold and generous. Be inspired; use bulbs for dramatic effect. 3. If your budget is really small, no problem. Find a lovely container and concentrate your planting in a pot. Then, turn your pot into a gorgeous feature by positioning it at a focal point where it will be appreciated – beside the front door or at the end of a vista, perhaps. 4. Keep it simple: you are not after the ‘fruit salad’ effect which is messy and lacks impact, so pick a few contrasting or complimentary types and plants lots (see point 1). 5. Don’t plant in straight rows: scatter instead. 6. Small groups of bulbs tucked among perennials, shrubs, or rocks create bright accents. Use types with large flowers such as daffodils and tulips, and group several together so they make a strong visual statement. 7. Mingle your daffodils among perennials like agapanthus or irises, or gentle ground covers to help hide their fading foliage later on. 8. Make a meadow: daffodils are perfect for planting under trees or in lawns to create flowery meadows. For a wild, natural look, toss them by the handful in beds or on the margins of your lawn and plant them wherever they land. A specialized bulb planting tool is ideal for this method of planting, and is available in garden shops and online.